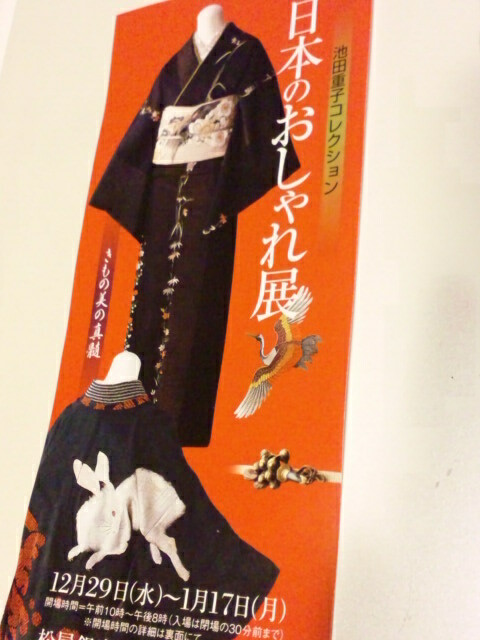 I went to the Shigeko Ikeda kimono collection exhibition in Ginza today. Shigeko Ikeda is the most famous kimono collector in Japan, and her collection contains about 10,000 of kimono and others. Today, I saw 60 of kimono coordinates. Her collection is just amazing!! Most of kimono are produced in the Taisho&Showa era, which is almost 80-100 years ago, however, they’re best-preserved. Each coordinating has its title and small explanation about kimono. I just got excited at seeing her collection, and learned more than I had expected about how to coordinate and even small things! I could see her there and really enjoyed the exhibition. Tomorrow is the last day. Whether you wear kimono or not, you may enjoy it. Why don’t you visit there?